The call comes in from the shadowy Ternky Tower: 13 robberies, one on each floor, all the way up to the penthouse, where obnoxious importer Bevel Ternky has been relieved of the numbers garlanding the legendary Emerald Khroniker, his priceless, ancient clock. Readers must conduct their own investigations, scouring detailed illustrations for hidden clues and knotty puzzles. All your answers can be found within this book: whodunit and how... and where the real numbers are buried now. Augustus Twintig was born in 1952 in the town of Dutch Oven, Pennsylvania, where his family ran a successful funnel-cake restaurant. He is the author of Mallow Me, Mallow You: A Year in the Marsh (a guide to rural confectioneries), and is a member of the Guild of Podiatric Investigators. Eli Horowitz has edited and designed books and journals for McSweeney's for the past eight years. Before McSweeney's, Eli was employed as a carpenter and wrote science trivia questions tenuously linked to popular films. He was born in Virginia and now lives in San Francisco. Mac Barnett is the author of Billy Twitter's Blue Whale Problem, Guess Again?, and the Brixton Brothers series. Born to non-farmers in a California farming community, Mac now lives near San Francisco. He's on the board of directors of 826LA, a nonprofit writing center for students in Los Angeles, and he founded the Echo Park Time Travel Mart, a convenience store for time travelers. Scott Teplin lives and works in New York City. His work has been included in exhibitions at the New Museum, the Drawing Center, the Bronx Museum, the Museum of Arts & Design, the Brooklyn Museum of Art and several shows at P.S. 1. His hand-bound books are included in the collections of MoMA, SFMoMA, the Smithsonian, the Walker Art Center, Harvard University, Yale University, and the New York Public Library. He currently exhibits with g-module in Paris and the Adam Baumgold Gallery in New York. "Ready to get your mind blown? Then dig into this enthrallingand oddly shapedbook.... Twintig (a pseudonym for Scott Teplin, Mac Barnett, and Eli Horowitz) has an absurd, dry wit (You should have seen my emotive facial expressions!” insists the mime). And those names! General Klobberduck. Jigsy Squonk. Sigfried Plumpjack. Rarely has a game of Clue been this fun. Oh, and those 12 bejeweled numbers? They’re real and buried in 12 holes across the country. This is not a joke. The codes to unlock their locations are hidden within each drawing. So insert your Holmes pipe and grab a shovel, because the real mystery is just beginning." "A marvel. Clock is a house-shaped board book chock full of mystery, humor and stunning artwork. Oh, and there are also clues that point to 12 emerald-encrusted numbers buried across the country, just in case the visuals don't hook you (which is unlikely)." "Enter the world's weirdest book. I'm sure there are other words for it, but the term 'weird' sticks out prominently in my mind. So too do the words 'wacky,' 'hypnotic,' 'awe-inspiring,' and 'potentially hazardous to your health.' I do not kid. I kid a tiny bit. But the fact of the matter is that if you or a child or you AND a child ever wanted to be a part of a real world treasure hunt, the time is now. For my part, all that I care is that there’s a new book out there with teeny tiny pictures for me to stare glazed-eye at for long periods of time. To stare and stare and stare.... what I really came to like and respect about The Clock Without a Face is that it has no difficulty defining its own audience. The writing and the pictures are hugely kid-friendly. Maybe a child wouldn’t have the wherewithal to solve the puzzles, but there’s always a chance. And where there’s a chance there will be kid fans. I know I’ll be handing my copy to the kids in the bookclub I run with the hope that they find a way to solve it themselves. Because even if they don't solve it, they're going to have a heckuva great time obsessing over its wackiness. Fun fun fun." "Clock seamlessly blends the playfulness of the kids’ books we wished we had and the sophistication of [McSweeney's] trademark design." Part The Westing Game, part Masquerade, this board book mystery lures readers in with its pentagonal shape, dry humor, and pages of intricate details. But the chief draw is the promise ofvery realburied treasure, with the clues to its locations hidden within the book. Given the potential of discovering clues to where the actual bejeweled numbers (created by jewelry designer Anna Sheffield) have been hidden, kids should be plenty motivated to pore over each scene." "Fun shape, fun story, fun pictures! If I had a kid who asked a million questions all the time, I would give them this, because it would shut them up for awhile. (Would probably also work on adults who need to be shut up.)" 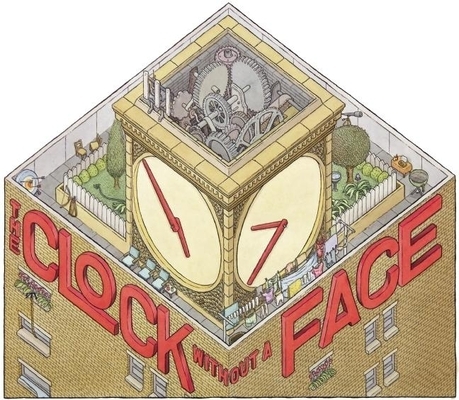 "The Clock Without a Face is the realization of every (inner) child's wildest dreams: a full color, illustrated mystery book packed full of clues that lead to real treasure." "This is a very cool book for the tween set (think 9-12). And really, any teens or adults that have browsed the book in my living room seem to love it just as much." "Leave it to McSweeney's to publish a book whose heist mystery extends past the confines of the book itself and into the actual real world. The book is sincerely funny, has great illustrations and is shaped like a house. Make no mistake, this book is delightfully silly above all things."